A highlight of the British Orchid Congress and show is the British Orchid Congress – Science and Conservation Symposium that includes lectures exploring a wide range of orchid research. Speakers include a number of early career scientists and the event is expected to generate some lively debate! 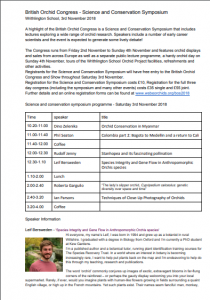 The Congress runs from Friday 2nd November to Sunday 4th November and features orchid displays and sales from across Europe as well as a separate public lecture programme, a hardy orchid day on Sunday 4th November, tours of the Writhlington School Orchid Project facilities, refreshments and other activities. Registrants for the Science and Conservation Symposium will have free entry to the British Orchid Congress and Show throughout Saturday 3rd November.